With stories of running away to Skegness aged 14 and the culture-clash of going from a council estate to Cambridge University, it’s fair to say Allan Hennessy stole the show this month. He’s that visually impaired Iraqi refugee whose recent BBC video went viral after he graduated with a first class law degree. Also in the studio is autistic trumpeter Robyn Steward who sparked a lively debate on the language of disability. And playwright Jackie Hagan recalls the weeks after her leg amputation when she had to use a food bank. She was forced to leave a trail of elderflower water and custard creams behind her because the parcel was too heavy to carry home while she was using her crutches. 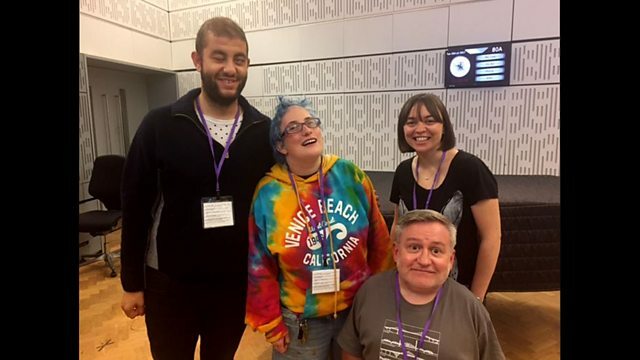 Jackie's play, Cosmic Scallies, about disability, poverty and friendship, is at the Edinburgh Fringe this summer. Presented by Kate Monaghan and Simon Minty.